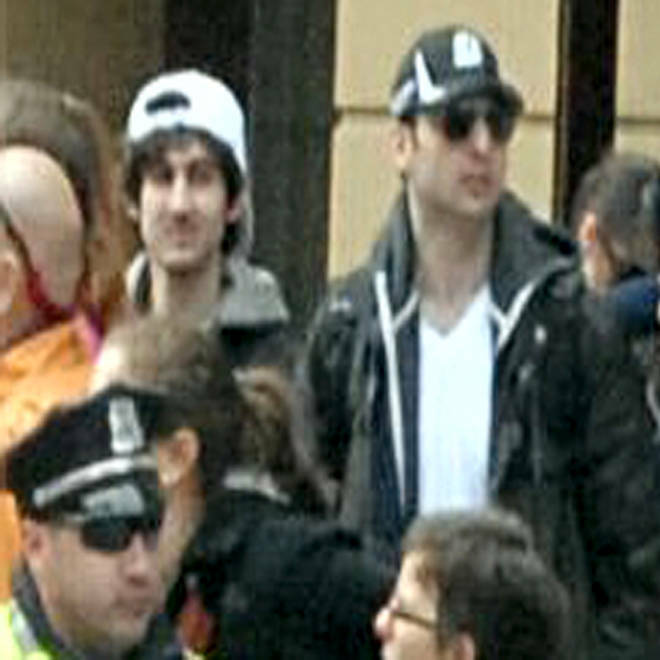 The two marathon bombing suspects. The man in the white hat is still believed to be at large. With a bomb strapped to his chest, one of the Boston Marathon suspects was killed early Friday after he and his accomplice brother robbed a 7-Eleven, shot a police officer to death, carjacked an SUV and hurled explosives in an extraordinary firefight with law enforcement, authorities told NBC News. The second suspect — the one in the white hat in photos released by the FBI — was on the loose. Gov. Deval Patrick ordered the entire city of Boston and some suburbs to stay inside during what he called a “massive manhunt,” and police began a house-to-house search. Boston shut down its buses and subway system. The suspects are brothers of Chechen origin with the last name Tsarnaev, law enforcement officials told NBC News. The suspect at large, Dzhokhar Tsarnaev, is 19, was born in Kyrgyzstan and has a Massachusetts driver’s license, they said. The dead suspect was identified as Tamerlan Tsarnaev, 26, born in Russia. Tamerlan Tsarnaev was run over by a vehicle during the firefight, law enforcement officials told NBC News. Law enforcement officials also told NBC News that the brothers entered the United States with family in 2002 or 2003, and that Tamerlan Tsarnaev became a legal permanent resident in 2007. The chaotic sequence of events started six hours after the FBI triggered a nationwide manhunt by releasing photos of the suspects, believed responsible for detonating two bombs at the marathon finish line Monday, killing three people and injuring 176. Watertown resident Andrew Kitzenberg says he had a "clear line of view" of what he said looked "like a pressure cooker bomb." The suspect at large was described by authorities as light-skinned and with brown, curly hair, and wearing a gray hoodie. “There is a terrorist on the loose,” a law enforcement officer said at a press conference before dawn. Police shut a 4-mile stretch of streets between Cambridge, Mass., and Watertown because they could be littered with unexploded devices, and they began a door-to-door search in Watertown. A convoy of at least 20 vehicles, including military-style humvees and buses, was seen descending on the town. More than 1 million people in Boston and the suburbs were ordered to stay inside and lock their doors. Harvard University, Boston University, the Massachusetts Institute of Technology, other colleges and Boston public schools all closed. Emerson University closed and told students to stay where they were. Andrew Kitzenberg, who lives in Watertown, said he saw the two men shooting at six police cars from 70 or 80 yards away. “There was a long exchange of gunfire,” told NBC News in an interview. He said that he saw the suspects use what looked like a pressure-cooker bomb. Investigators believe at least one of the two bombs that exploded at the marathon finish line was housed in an ordinary kitchen pressure cooker. Police with guns drawn search for a suspect on April 19, 2013 in Watertown, Mass. 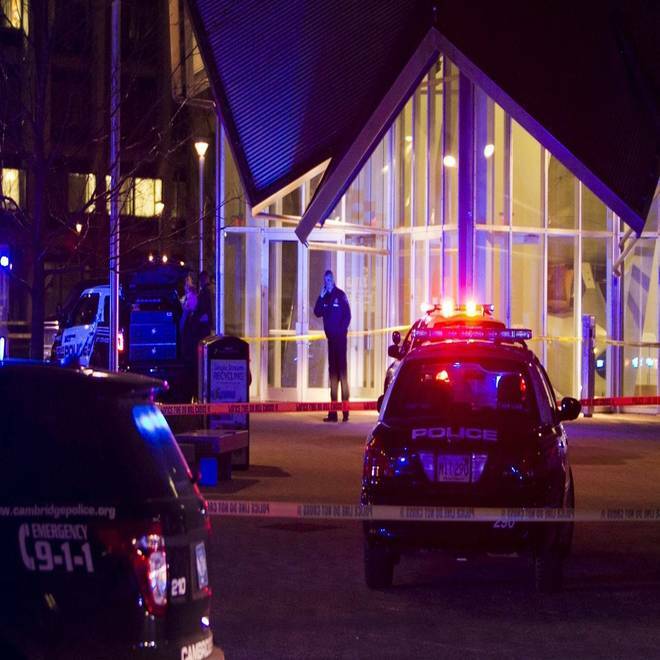 Earlier, a Massachusetts Institute of Technology campus police officer was shot and killed late Thursday night at the school's campus in Cambridge. A short time later, police reported exchanging gunfire with alleged carjackers in Watertown, a city near Cambridge. It's not clear whether the shootings are related or whether either are related to the Boston Marathon bombing. President Barack Obama was briefed overnight on the events, a White House official told NBC News. On Thursday, he spoke at a prayer service for the marathon victims and vowed that the people responsible would be caught. 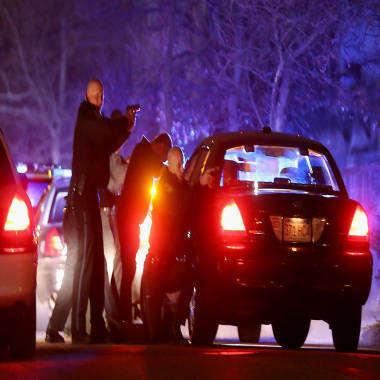 Law enforcement officials said the tumult began just before 11 p.m., when the suspects approached a police officer from the Massachusetts Institute of Technology and shot him in the head. The two then stole the officer’s cruiser, robbed a nearby 7-Eleven, carjacked a Mercedes SUV and briefly kidnapped the driver, the sources said. The suspects threw explosives out the window during the chase that followed, they said. A Boston transit police officer was shot and wounded, authorities said. The dead suspect — the man in the black hat from the FBI photos — had an improvised explosive device strapped to his chest, law enforcement officials said. Kitzenberg said that the firefight ended when one of the shooters ran toward the Watertown officers and ultimately fell to the ground. Kitzenberg said he could not tell whether the man was tackled or had been shot. The other drove the SUV through a line of police offcers at the end of the street, he said. A bullet from the gunbattle lodged in the wall of Kitzenberg’s apartment, he said. Massachusetts State Police, Cambridge Police and MIT Police search at the scene of the shooting of a Massachusetts Institute of Technology (MIT) Police Officer in Cambridge, Massachusetts, April 18, 2013. This is a developing story. Please check back for more updates. Tom Winter, Kerry Sanders and Jonathan Dienst of NBC News contributed to this report. Reuters also contributed to this report.